Originally posted by Joe Wilcox of Betanews. Reposted here for my own notes on how early strategic choices create ripples of opportunity down stream. Apple made these investments during difficult times. The dot-com bust rippled disastrously through the tech industry, the United States was gripped in recession and Apple’s stock value had collapsed. Shares opened at $343.72 today about four bucks off the 52-week high. Apple’s market capitalization was $317.21 billion at yesterday’s close. Going back in time, Apple shares traded for less than $10 a decade ago. As I explained last month, Apple’s fortunes have dramatically changed. In January, Apple unveiled the iTunes music player. In March, Apple launched troubled Mac OS X 10.0 and relaunched as 10.1 in September. In May, the company opened Apple Store, in two locations — California and Virginia. In October, the first iPod debuted. At the time, iTunes, Mac OS X, Apple Store and iPod, seemed like innocuous launches, but they would later be the four pillars raising Apple’s brand from obscurity to mass popularity. There was no active blogging community in 2001, just a grabbag of early adopters; the tech news media covered each product’s introduction, and there was plenty of skepticism. No one, except some visionaries inside of Apple, saw the potential. In January 2001, Apple debuted iTunes for Macintosh, a catchup product released late during the early file-trading era, amid mainstream media skepticism. The world used Windows and Microsoft would greatly update its media player for Windows XP, which shipped in October 2001. There was RealPlayer to compete with, too. But the software would eventually morph into a music store, and later one for videos and applications. More importantly, iTunes would become Apple’s synchronization engine for all kinds of content. In March 2001, Mac enthusiasts were hugely excited about Mac OS X, but it caused Apple to go two, or even three, steps back before taking any forward. Major developers would take years supporting the new operating system. Who could imagine that from Mac OS X, Apple would later create iOS, which today is its most important operating system; iOS products accounted for about 65 percent of Apple revenue during fiscal 2011 first quarter. The developer ecosystem that would later support Apple’s App Store cut its teeth on Mac OS X. 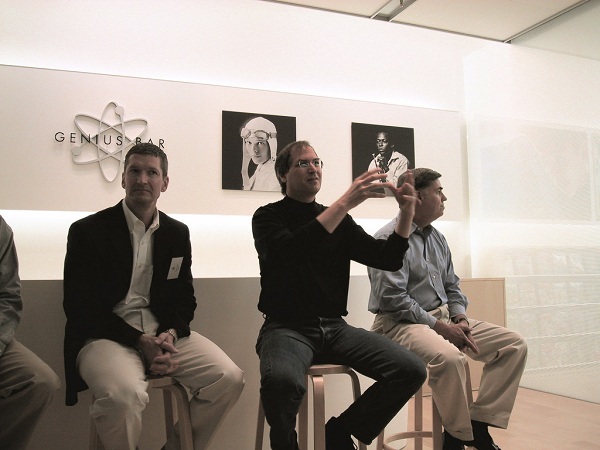 In May 2001, the first Apple Store opened in McLean, Va. I was there for the official news media unveiling and launch days later. Timing struck most analysts I interviewed as strange: Gateway was getting out of retail just as Apple wanted in. But the stores increased exposure to Apple’s brand and provided a place to foster Mac community and lifestyle, around digital activities like listening to music and watching, making or sharing videos. Apple CEO Steve Jobs started consistently talking about the Mac as digital lifestyle hub, from early 2000. But the company also later extended the Apple lifestyle to Windows PCs, through AirPort Extreme, Apple TV, iPad, iPhone, iPod, iTunes, iTunes Music Store, MobileMe and Time Capsule. Most of these products are sold through Apple Store. More broadly, Apple honed its manufacturing and distribution channels to support its retail operations. As I explained last month, these channels proved essential to the success of iPod (in the mid Noughties), iPhone (from 2008) and iPad (2010). In October 2001, Apple released iPod, a 5GB music player that excited enthusiasts but not the mainstream market. That success wouldn’t really come until the release of iPod mini (2004) and successor iPod nano (2005). Meanwhile, Apple opened more stores and improved distribution logistics and marketing that proved crucial to driving interest in iPhone and iPad. Many of the supplier logistics and contracts crucial to supporting iPhone and iPad evolved from Apple’s work on iPod. There is a fifth product that warrants calling out, and it came later: Safari. While Safari probably wouldn’t exist without Mac OS X, the browser’s lineage is really separate. Safari debuted on Mac OS X in 2003 and on Windows in 2008. The browser is an essential component of many Apple products — modern iTunes, iPad, iPhone and iPod touch, among them. Safari’s importance to Apple and even its competitors can’t be understated. Google’s Chrome uses the WebKit rendering engine Apple released as open source. Few success stories are overnight sensations. Apple made crucial investments during hard times that transformed the company in 2010. Can it get any better than this?